Whilst Danish director Niels Arden Oplev’s original (and best) adaptation of Stieg Larsson’s The Girl with the Dragon Tattoo (2009) possessed many notable merits, less can be said of his first foray into the American market, Dead Man Down (2013). This clumsily contrived thriller stars Colin Farrell as the strong and silent Victor, the muscle in a gang headed up by dapper don Alphonse (played by an unrestrained Terrence Howard). Victor has infiltrated the gang by carrying out whatever murderous tasks the job demands, gaining the trust of the mob boss with one sole purpose: revenge for the death of his wife and child years earlier. Farrell’s Victor anonymously taunts Alphonse through a series of unsubtle mind games, which includes leaving pieces of a photo of who his would-be-killer is. However, the plan goes awry when he is discovered knocking off a member of Alphonse’s gang by his Danish neighbour, Beatrice (The Girl with the Dragon Tattoo’s Noomi Rapace), a woman who uses this information to blackmail Victor into helping her carry out her own deep-seated vendetta. Dead Man Down’s oft-ludicrous, frustratingly baggy script is by J.H. Wyman, who was the scribe responsible for the abysmal 2001 Brad Pitt/Julia Roberts flop The Mexican. This affords some prior warning for what lays in store. Throughout, we’re provided with many of the tropes of a conventional revenge thriller, but continually the tale lacks the necessary cohesion of plot due to thrown away, illogical and unremarkable twists. Rapace’s character, for instance, seeks revenge for a drunken hit and run that has left her scarred. Whilst this apparent disfigurement is one of those Hollywood scars that accentuate beauty rather than distort it, it seems enough to turn her into a woman possessed. Ultimately, Beatrice madness could just as plausibly be down to the nagging of her Tupperware-obsessed mother, Valentine (an out-of-sorts Isabelle Huppert), with whom she lives – such is the scripts farcical nature. Two whole hours go by and we’re simply left unsatisfied and bemused at what has passed over our eyes. 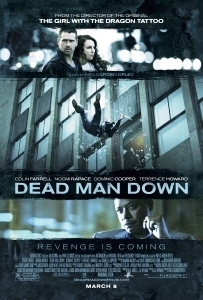 Deprived of decent pacing and far too serious for its own good, Oplev’s Dead Man Down is an at-times artful action thriller with a handful of puissant performances (given the material), which unfortunately descends into utter silliness more quickly than had been hoped.